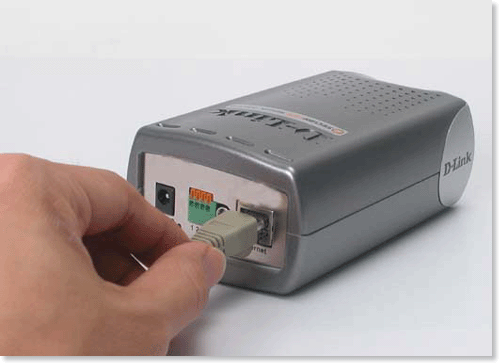 Step 1 Connect an Ethernet cable to the Ethernet port located on the back of the camera and connect it to a networking device such as a router or switch. 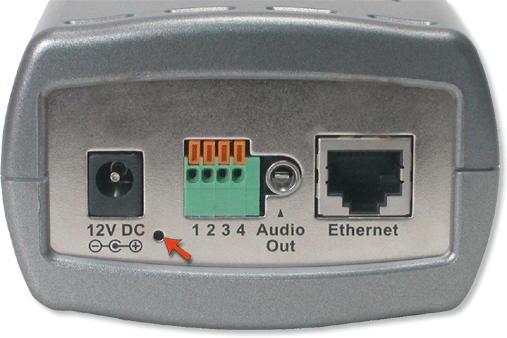 If you are connecting the D-Link DCS-3220G to a wireless network connect the antennas to the back of the unit. Step 2 Attach the external power supply to the DC power input connector located on the back on the camera labeled 12V DC and connect the other end to a wall outlet. When you have a proper connection, the LED will change from red to green. 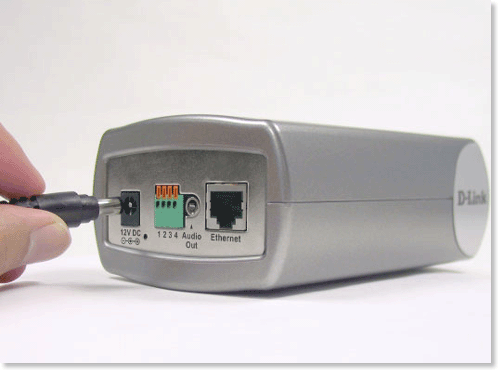 If you are directly connected to the camera via a crossover cable, the light may cycle on and off and your computer may show an intermittent loss of connectivity. This will stop once you have configured the camera from your computer. Step 3 Use the Install Wizard to detect the camera. DCS-1110 device, Master CD with manual and software, QIG, 2.0dBm antenna, 5V 2.5A switching power adapter, Cat.5 RJ-45 cable, Stand and Mounting Bracket. DCS-2100G device, Master CD with manual, software, QIG, 5V 2A switching power adapter, Cat.5 RJ-45 cable, Stand and Mounting Bracket. DCS-2120 device, Master CD with manual software, QIG, 2.0dBm antenna, 5V 2.0A switching power adapter, Cat.5 RJ-45 cable, Stand and Mounting Bracket. DCS-3220 Device, CD with manual, QIG, 12V 1.5A Switching Power Adapter, Cat.5 RJ-45 Cable, Mounting Bracket. DCS-3220G Device, CD with manual, QIG, 12v 1.5A Switching Power Adapter, Cat.5 RJ-45 Cable, 2.0 dBm Antenna, Mounting Bracket. DCS-3420 Device, Switching power adapter, Bracket, Antenna. DCS-5220 device, Master CD with Manual and Software, CAT-5 RJ-45 Cable, Mounting Kit, Power Adapter, Antenna, QIG. DCS-950 Device, Master CD with manual & software, QIG, 5V 2.5A switching power adapter, Cat.5 RJ-45 cable, Stand and Mounting Bracket. DCS-950G Device, Master CD with manual & software, QIG, 2.0dBm Antenna, 5V 2.5A Switching Power Adapter, Cat.5 RJ-45 Cable, Stand and Mounting Bracket. DCS-G900 device, Master CD with manual & software, QIG, 2.0dBm antenna, 5V 2.5A switching power adapter, Cat.5 RJ-45 cable, Stand and Mounting Bracket. Some SMTP servers will require various forms of authentication. One form is to authenticate based upon the sender’s e-mail address. This is the same as the Return Address. Therefore, it would be best to change the Return e-mail address to an address that matches the SMTP server’s domain. Another form of authentication is a user name and password. Step 1: Log into your camera and click on Configuration. Go to Advanced > Mail & FTP and fill out the SMTP information. Recipient e-mail address = destination e-mail address. Sender e-mail address = who is sending the e-mail. Please note that SMTP #2 is for backup purposes. If the first address fails, the second will take over. Return e-mail address = e-mail address that will be notified in the event of a failed to send. If you do not want to enter a return e-mail address, put a fake address in this field. You MUST enter a valid e-mail address format (user@mymail.com) or the pictures will not send. In order for the SMTP authentication to work, the D-Link camera DNS fields must be from your ISP, not the router´s IP address. Step 2: Go to Tools > Applications. Step 4: Select Event Operation. Step 5: Under Trigger Condition select which window you want to Detect motion in: the 1st, 2nd, or 3rd motion detection boxes depending on how many you created from the motion detection screen. Step 6: Under Trigger Action select the box next to Upload snapshots while motion detected. Step 7: Select Send snapshots by e-mail. NOTE: This camera does not have the option to change SMTP options. The SMTP server must use standard SMTP port 25 and you will be unable to connect to an email server that uses SSL authentication.